Personalized & Professional Eye Care in San Francisco. We’ll help you see and look your best at City Optometry, located just down the street from the grand China Gate, servicing Downtown San Francisco, China Town, the Financial District and Union Square. When you visit our modern, friendly office, our eye doctor will value and treat you as a unique individual. We’ll get to know you – your health condition, lifestyle preferences, and visual expectations – in order to provide personalized eye care services. Vision is the foundation of a high quality of life. How else could our San Francisco patients gaze at the Bay’s scenic shoreline and the soaring spans of the Golden Gate Bridge? To ensure that you maximize life and enjoy your surroundings to the fullest, our eye doctors provide a full range of expert care for your eye health and vision. Whether you visit our optometrist for a comprehensive eye exam, treatment for an ocular disease, or a new pair of designer frames, you’ll have our full focus! 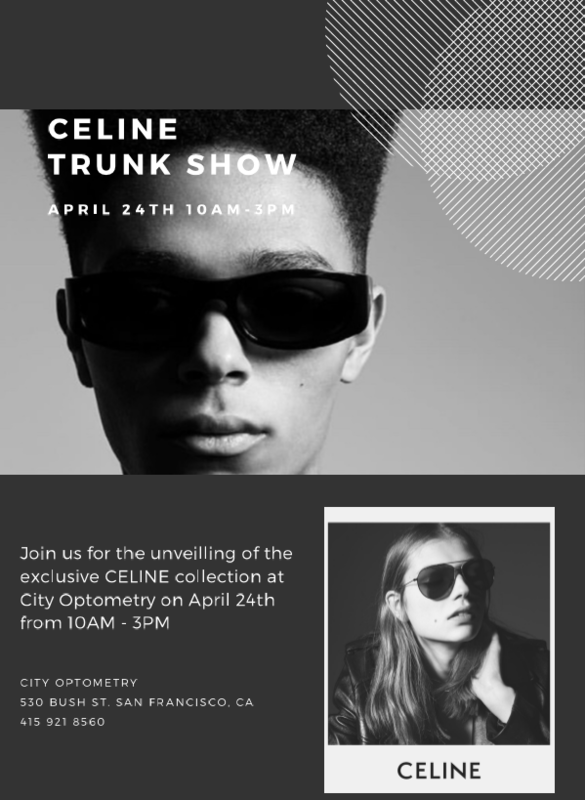 We offer an incredible collection of high fashion, quality eyewear at City Optometry. Our office is located conveniently in San Francisco’s financial district, and walk-ins are welcome. If you suffer from car sickness, motion sickness, headaches, lightheadedness, dizziness, disorientation or anxiety? You could be suffering from Binocular Vision Dysfunction (BVD). Dry eye syndrome is a common condition that affects many people, especially women over age 40. City Optometry has one of the largest Dry Eye Clinics in the Bay Area. See why over 700 patients recommend City Optometry! City Optometry is the best. I have been going there since ~2010, Dr. Penza does specialized hard contact lens fittings and has the equipment for sophisticated medical eye exams. Dr. Penza is very knowledgeable and experienced, and terrific to work with, as is his staff. I really appreciate that they are so knowledgeable and conscientious about my health insurance coverages too. Everyone here is great! With regard to the ecam itself, Dr. Penza is very nice and professional. Whether you're there for a quick annual checkup and prescription update or something a little more serious, he spends the right amount of time with you. I also worked with Mia to get me glasses, and stuff always the best part of the experience. She works with you to make sure you feel like the best version of yourself with your new glasses, and that you can see the best, too. Mia is always incredibly kind and honest, and one of the main reasons I come back to City Optometry. They also have a great collection of frames and stay current with trends and classics. They're eye exams also offer the latest technology to make everything as easy as possible. Excellent eye exam from Dr. Penza with assistance from Kim. Repeat customer and very satisfied. Friendly, professional, efficient, and helped to diagnose a vexing condition. Thank you! Phenomenal service! Dr. Penza and Dr. Morioka are amazing optometrists. I always leave their office confident in my prescription and my overall eye health. I’ve seen both doctors throughout the years. They’re both very detailed, consistent and efficient. The staff is also super friendly and always helpful as well. I honestly recommend this place to everyone I know. We furnish our office with the latest high-tech optometric equipment, so you receive precise diagnoses and state-of-the-art treatment. Using expert skill, Dr. Vincent Penza and Dr. Katherine Morioka will examine your eyes thoroughly to detect any signs of a vision condition or eye disease. We welcome patients of all ages, from infants to golden-agers, to visit for a comprehensive eye exam. If you have an ocular disease, such as macular degeneration, cataracts, or glaucoma, our eye doctors will monitor your condition and help manage it to prevent complications and vision loss. Seeing should be comfortable. Do you suffer from itchiness or stinging? Eye allergies, dry eye syndrome, and eye infection can all lead to painful vision. We will evaluate your condition to pinpoint the cause. This is the most reliable way to recommend treatment that will alleviate your discomfort. Our eye doctor is both knowledgeable and experienced in matching patients with the most effective treatment. To restore your comfortable vision, contact our optometrist to book an appointment. No matter what you need, we will always go the extra mile to make your comfortable, quality vision last as long as possible.